June 12, 2012 by C.S. Clarke, Ph.D.
They’re everywhere. 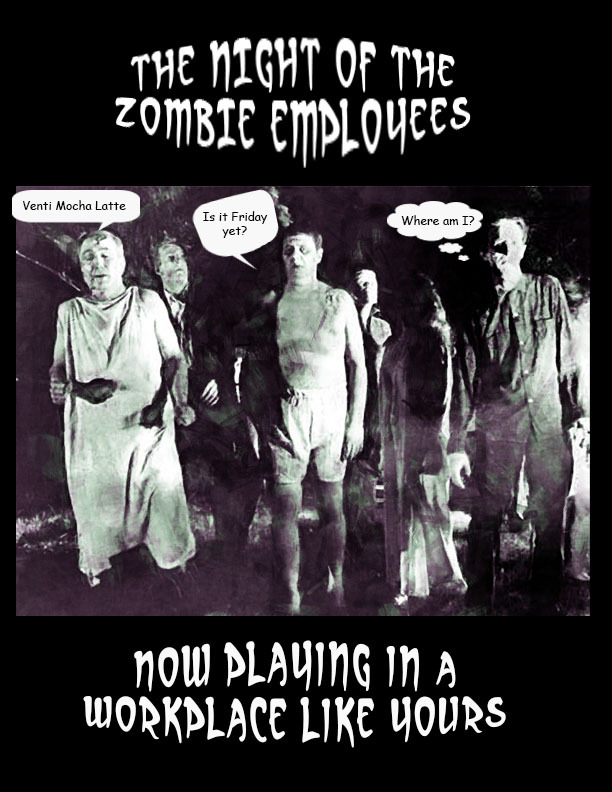 Zombie employees. You see their listless, soul-less, “the-porch-lights-are-on-but-nobody’s-home” behavior. They do only what they’re told to do and then do nothing until instructed what to do next. They’re bored. They’re resentful of requests to do anything new or different. If they don’t know something, they don’t try to find out. If they do know something, they don’t share it. I could go on, but you know them. You’ve been a customer who’s had to deal with them. You’ve been a manager who’s had to try to get work out of them. You’ve been a co-worker whose projects are held up by them. There are many theories about what causes employee attitude and behavior like this. Some assign blame to the lack of engagement. Or to lack of training. Or to lack of motivation. The possibilities seem endless. Bill Jerome’s “Learn To Keep Your Company Free Of Zombie Employees” — http://www.bizjournals.com/louisville/print-edition/2011/07/15/learn-to-keep-your-company-free-of.html?page=all — covers the subject from the point of view of employers. Jerome offers a 5-question “zombie test” that assesses how corporate organization, management and culture might encourage or discourage zombie behavior in a company. In “The Manager’s Guide to Surviving the Zombie Employee Apocalypse” –http://blog.upmo.com/2012/05/03/the-managers-guide-to-surviving-the-zombie-employee-apocalypse/ — Merry Richter talks about the possible effects of the current recession and the traumas of unemployment, underemployment and overwork in the aftermath of radical downsizings. Jeff Hunter speaks directly to employees who have been “zombiefied” by lousy or dead-end jobs in “Are You a Zombie Employee & Job Seeker?” — http://www.glassdoor.com/blog/zombie-employee-job-seeker/ — He suggests that choosing a better job, career or employer might be the answer for the individual. All of these writers have good points. For decades, management consultants have been trying to help companies figure out how to transform unproductive, unmotivated employees. Many techniques have been developed. They’ve often worked. But no one’s ever found any real generally-applicable solutions. Solutions that can be repeated in most organizations and situations. Managers, co-workers and the affected employees themselves have to try various solutions to see what works. A good deal of the time, nothing does work. And, it’s been going on from time out of mind. Whatever the status of the worker — employee, serf, servant, slave, monk, nun, bondsman, apprentice — and whatever the status of the boss — master, nobleman, landlord, employer, abbot, mother superior, master craftsman — the one in charge has often complained of the laziness and stupidity of the worker, and the worker has often complained of the unreasonableness or downright evil of the boss. Even in domestic service there have long been books like “The Servant Problem : An Attempt At Its Solution” by “Experienced Mistress” (1899) — http://archive.org/details/servantproblemat00expeuoft — that tell the tales of woe in managing household workers. There have always been plenty of worker “zombies” who want to have jobs and be paid, need to have jobs to survive, but don’t want to work. Don’t like to work. Never intend to do more than they absolutely must. Workers who will never improve, regardless of training, motivational programs, coaching, rewards or punishment. The sad truth is that you have to be able to know well and assess each (yes, each) individual to see why he or she has gone “zombie.” Or if he has always been a zombie worker. You will have to decide how much work it will take to make him productive. Figure out if he can be made productive at all or if he will always be a zombie worker. That means you’ll have to actually talk with him about it. Listen to what he has to say. Talk with others who work with him. Find out if he has a reason for his behavior and attitude, or if he’s just one of the kind who never wanted to actually work. Find out if you can accommodate his particular needs and still get the time and money value back that you need for your efforts. See if you think he’s worth it. If he is, great. It’s usually better for the organization and everyone involved if you can transform the relationship to a productive one. But remember, much of the time it just isn’t worth the effort unless you know for sure at least half of the problem is with the organization and not the employee. Much of the time it’s just better to replace the employee. You’re not a social worker. You’re a business owner or manager who needs to get the work done and make money for the business. New on the job: Three Rules of Working.